Online privacy is tricky. The information that we put in digital form can now be readily accessed by unintended viewers, whether because of an oversight in selecting privacy settings, the vulnerability of “secure” online data, sharing passwords that grant others access to personal accounts, or simply because a friend’s eyes wander to read personal text messages. Work together with your kids to be vigilant about keeping private information private. • Underscore that any digital information has the potential to go public. Information posted online or shared digitally (a picture, a status update, a text message) is searchable, easily copied, and often permanent. Even if your kids set strict privacy settings, there is the chance that a friend could copy/paste, take a screenshot, save, or forward something your kid didn’t want to get widely shared. Or, a curious onlooker may simply steal a glimpse at their screens and read private messages. Password sharing with friends, while often done causally, leads to serious privacy issues and should be avoided. Make sure your kids know that it is their responsibility to set privacy settings thoughtfully and to keep passwords private - but also remind them that anything shared digitally might be seen by unintended audiences. • Together, set privacy settings on all social media accounts. On a daily basis, you and your children probably use different apps and sites. Together, explore how varied privacy settings and privacy policies are. Discuss how companies use their members’ personal information, and urge your children to be responsible and use “friends only” privacy settings. Many social media platforms default to mostly “public” settings — requiring users to set privacy controls. And many sites frequently require updates, which reset all settings back to the default. Not only will these opportunities help safeguard you and your children, but you will get insight into how and why your child participates in the digital world. • Be patient and take the time to understand all the features. While companies don’t always make it easy to understand their privacy settings and privacy policies, take the time to dig in. Be wary of “social sign-in” (like using your Facebook or Twitter login to sign onto other sites), because that entitles third parties to collect data from your accounts. Set privacy settings for each and every type of content — profile information, posts, comments, and photos. And learn what individual features do, like tagging and blocking, to help you and your children manage and control your presence online. If your kid’s school provides devices, it may have the right — and responsibility — to monitor all content on the machines. Make sure your children know that they can’t assume their digital life is private from you or from anyone else. 1. Talk with your kids about Internet Safety.Talk to your kids regularly about what they do online and what they shouldn't do. Research shows that kids whose parents talk to them about Internet safety are less likely to engage in risky behavior while online. 2. Know which devices in your home have Internet access.The typical family uses five internet-enabled devices in the home. Most Internet Service Providers offer free software to protect the home computer. 3. Use parental controls on all mobile devices.Remind your kids that the same rules that apply to the home PC also apply to their mobile devices – wherever they use them. Basic parental control features can be found in the settings section of most devices. 4. Tell your kids not to respond to online messages from people they've never met.According to a survey from Cox and the National Center for Missing & Exploited Children, 42 percent of tweens (10- to 13-year olds) have received messages from people they've never met. 5. Make sure your kids visit age-appropriate sites.When you hear your kids talk about a new website, check it out. If you approve the site, then sit with them as they visit the site to see what they do or learn. Find sites that promote learning, creativity, and that deepen your kids' interests. 6. Don't pass up password protection.Enable passwords on all mobile devices. That way your child will have to come to you enter the password so you'll always be aware of when they are using the device. 7. Have some rules about time and place for using mobile devices.Set limits on the amount of time your kids spend online using mobile devices and where they can use them. Don't let them 'instant message' if you don't have monitoring software on the mobile device. Restrict time and sites for online gaming. 8. Agree on downloads.What music is okay? Which video sites are okay? Don't share your passwords with your kids that will allow them to download music, games, videos, etc. to mobile devices. If they need to download something, you should always be involved. 9. Make sure kids feel safe to talk with you about their online activity.Your kids need to know they won't get in trouble if they tell you or another trusted adult if anything suspicious, mean, or scary happens. 10. Be involved online.Parents are the role models for safe and smart use. Enjoy the good stuff together by joining social networks that your kids are involved in and by sharing favorite apps and helpful web sites. Contrary to popular belief, most online predators are not pedophiles. Pedophiles target pre-pubescent children, while online predators typically target adolescents who engage in risky online behavior. Hear the true story of a 15-year-old girl who left home to meet in person with a man she first "met" online. 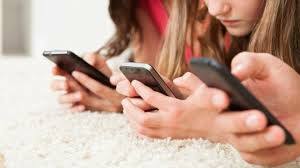 ​﻿ 71% of teens ages 13-17 reported receiving messages online from someone they didn’t know. When teens receive messages online from a stranger, 40% reported that they usually reply and chat with that person, but only 18% said they tell an adult. 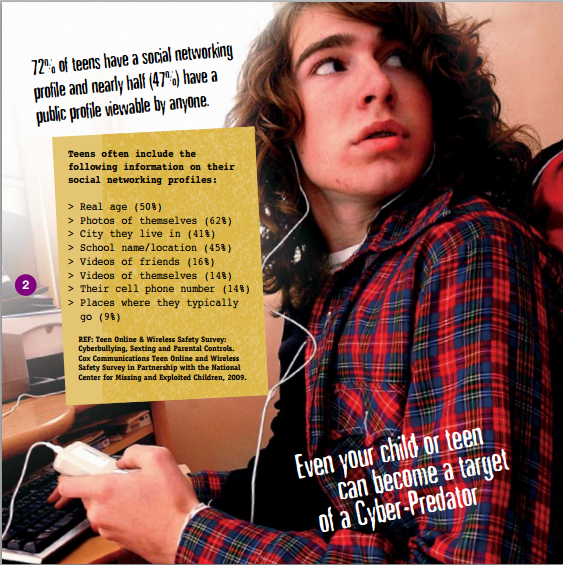 45% of teens have been asked for personal information by someone they don’t know. 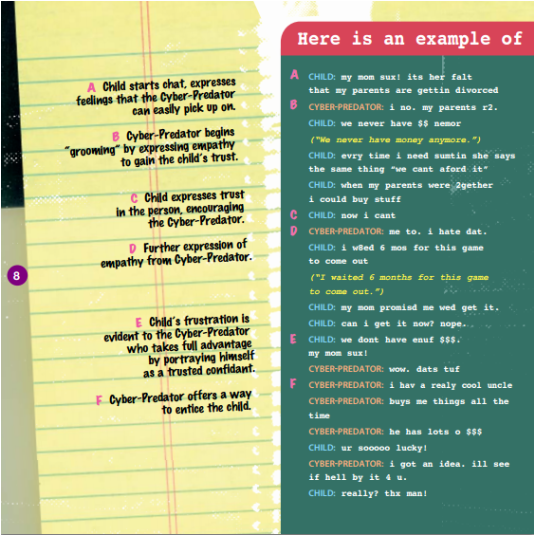 30% of teens have considered meeting someone they have chatted with online and 14% have actually had such an encounter. 1 in 7 teens has received unwanted sexual solicitations online. One third (31%) of these solicitations were aggressively seeking offline contact.